Built to deliver electricity to city and metropolitan area residents, one of the ironies of building large, utility-scale power facilities is that the electricity, in many cases, bypasses adjacent and nearby communities. That can generate local mistrust and opposition to project development, especially when it means residents will be displaced. It can also spur government agencies, community residents, utilities and other power industry businesses to join in carrying out innovative projects that convey benefits to all stakeholders. 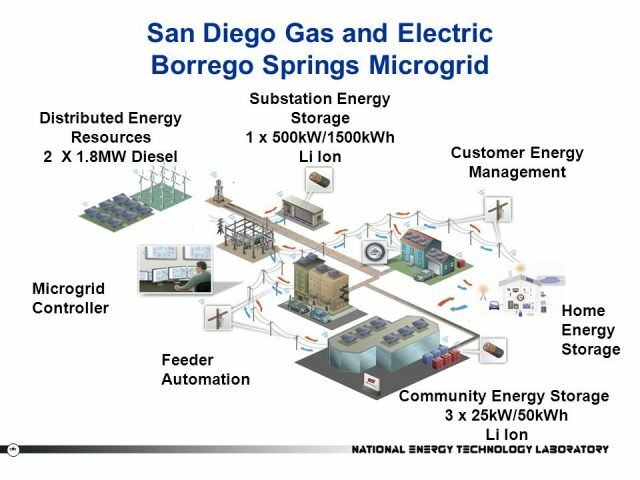 Development of a leading edge solar PV-energy storage microgrid in Borrego Springs, a small town of some 3,500 permanent and seasonal residents located about 80 miles east of San Diego on the floor of the Borrego Valley, provides a case in point. Situated at the westernmost edge of the Sonoran Desert, Borrego Springs sits surrounded by the Anza-Borrego Desert State Park, home to an abundance of unique flora and fauna. That said, climate in the Borrego Valley is arid and subject to extremes. Average maximum/minimum winter temperatures come in at 69/43.4 degrees Fahrenheit (20.6/6.3ºC) and top out at 106.8/74.9 (41.6/23.8) in July. Residents’ electricity bills can top $1,000 during summer months, one resident told Inside Energy. Sunny days average 264 per year, however; which makes Borrego Springs an attractive place for solar power production. Backed by a power purchase agreement with San Diego Gas & Electric (SDG&E), NRG Energy commissioned the first utility-scale solar energy facility at the edge of town in 2013. The 26 MW Borrego Solar Generating Station produces enough emissions-free electricity to meet the needs of some 25,000 homes, but it was built to transport electricity to San Diego. The electricity Borrego Springs residents relied on up until recently was delivered long distance, via a single high-voltage power line that stretches all the way back from San Diego. The town’s vulnerability to a power outage, and all the associated damages and costs, became apparent in that same year when a storm brought down 19 SDG&E power lines, including Borrego Springs’, Erik Anderson recounts in a Dec. 21 KPBS news report. 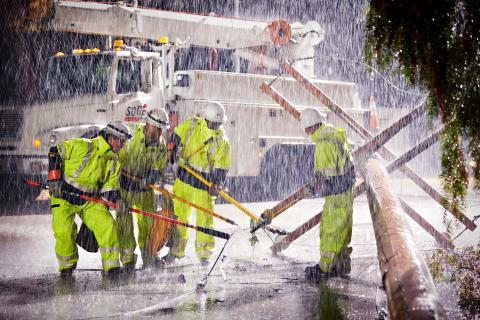 SDG&E employees scrambled to restore the town’s power supply. Delivering power directly from the Borrego Springs Solar Generating Station was the obvious choice. That got everyone thinking about a longer term solution, a process that resulted in construction of the town’s solar-plus-storage microgrid. Proving itself by supplying power by delivering power in autonomous, “island” mode during subsequent storms, SDG&E received a $5 million state grant from the California Energy Commission (CEC) in February 2015 to expand the system so that solar could meet all Borrego Springs’ electricity needs. “This funding will create a true renewable energy microgrid, one that not only bolsters local electric reliability, but does so by using the cleanest resources available,” SDG&E’s senior vice president for power supply James Avery said at the time. Borrego Springs solar-storage microgrid is an example of an “unbundled utility microgrid” – one where distribution assets are owned by a utility (SDG&E) while some or all of the distributed power generation assets are owned by customers, Berkeley Labs’ Microgrids-Grid Integration Group explains. Launched as a renewable microgrid “proof of concept,” the project attracted a host of prominent companies as partners – Lockheed Martin, IBM, Advanced Energy Storage, Horizon Energy, Oracle, Motorola, Pacific Northwest National Laboratories, and University of California San Diego. The U.S. DOE supported the project with $7.5 million of federal funding. SDG&E pitched in $4.1 million and CEC contributed $2.8 million. Other partners added $0.8 million. Expansion plans called for 4 MW of solar power capacity from the NRG PV facility and another 700 kW from rooftop solar installations. Energy storage is provided by a 500 kW/1500 kWh battery array at the SDG&E substation, three smaller 50 kWh batteries and six 4 kW/8 Mwh home energy storage units. Two large, 1.8 MW diesel generators add another, emergency back-up layer of generation capacity. Designed to serve as the primary energy source for 2,800 Borrego Springs residents, SDG&E sees the microgrid as a means of reducing capital costs associated with generation and T&D infrastructure. Local residents will benefit from more reliable, resilient, efficient and environmentally friendly source of electrical power. Customer engagement and participation is a core aspect of Borrego Springs’ solar-storage microgrid. SDG&E is looking to it as a testing ground for a price-driven customer demand response (DR) system that takes advantage of 125 residential home area network systems to interact with in-home energy storage, electric vehicles (Evs) and smart appliances. At the system control level, the microgrid platform incorporates supervisory control and data acquisition (SCADA) on all circuit breakers and capacitor anks. Feeder Automation System Technologies (FAST),outage management systems, and customer-level, price-driven load management. Andrew is a well seasoned and traveled freelance reporter and editor, covering the the nexus where new energy technology, markets, ecosystems and political economy intersect and overlap.